Charles H. Toliver, IV is a former two-term Judge of the Delaware Superior Court, having been appointed in 1990 as an Associate Judge by Governor Michael N. Castle, and reappointed in 2002 in that capacity by Governor Thomas R. Carper. During his 24 years on the bench, Judge Toliver presided over numerous significant civil and criminal cases. 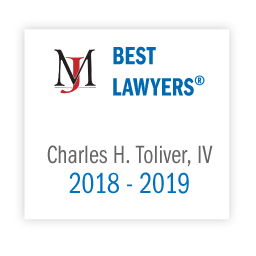 As a member of Morris James’ ADR Practice, Judge Toliver focuses his practice on civil, corporate and domestic relations mediation, arbitration and case analysis. Judge Toliver formerly served as Assistant City Solicitor for the City of Wilmington from 1975 to 1978. From 1978 until his appointment to the Superior Court, he was engaged in the private practice of law with Leonard L. Williams & Associates and Biggs & Battalgia, both in Wilmington. Judge Toliver has also served as an instructor at the University of Delaware and Delaware State University. He is a member of the Board of Directors of the Lincoln Club of Delaware and the Greater Wilmington Convention and Visitors Bureau. He is also a former Chairman of the Wilmington Housing Authority and has served as a member of the Delaware Public Employment Relations Board, the Delaware Violent Crimes Compensation Board, the Wilmington Pension Arbitration Board, and St. Anthony's Community Center. In 2003, Judge Toliver was appointed as one of the two representatives from the State of Delaware on the Brown v. Board of Education 50th Anniversary National Commission by President Bush. Before being appointed to the Superior Court, he served as Treasurer and Assistant Treasurer of the Delaware State Bar Association and as an associate member of the Board on Professional Responsibility of the Delaware Supreme Court.